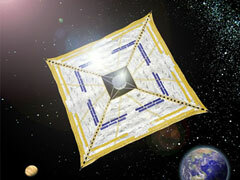 A Solar Sail is a space ship that gathers sunlight as propulsion by means of a large membrane. On the other hand, a Solar "Power" Sail gets electricity from thin film solar cells on the membrane in addition to acceleration by solar radiation. What's more, if the ion-propulsion engines with a high specific impulse are driven by such solar cells, they can become a "hybrid" engine that is combined with photon acceleration to realize fuel-effective and flexible missions. 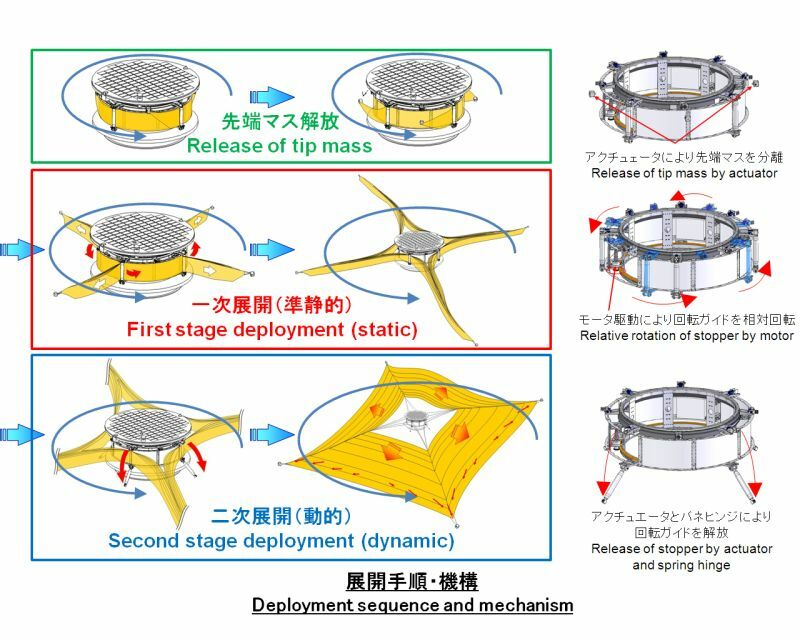 The IKAROS (Interplanetary Kite-craft Accelerated by Radiation Of the Sun) mission aims at verifying that a spacecraft can fly only by solar powered sail, and that thin film solar cells can generate power. The IKAROS will be launched with the Venus Climate Orbiter "AKATSUKI" by an H-IIA Launch Vehicle. A solar sail can move forward without consuming propellant as long as it can generate enough energy from sunlight. This idea was born some 100 years ago, but it had lots of technical hurdles such as the appropriate material and deployment method for the sail. Recently, we have finally seen some prospect of using this technology practically. The sail of the IKAROS is a huge square some 20 meters in a diagonal line, as thin as 0.0075 mm, and made of polyimide resin. On the membrane of the sail, thin film solar cells are attached as well as an attitude control device and scientific observation sensors. 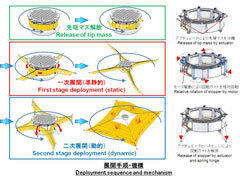 This thin and light solar sail membrane will be deployed using the centrifugal force of spinning the main body of the IKAROS before its tension is set. The deployment is in two stages. The first stage is carried out quasi-statically by the onboard deployment mechanism on the side of the main body. The second stage is the dynamic deployment. As this deployment method does not require a strut such as a boom, it can contribute to making it lighter and thus can be applied for a larger membrane. Let's set sail for the solar system on a solar yacht! The Japan Aerospace Exploration Agency (JAXA) and The Planetary Society ( TPS ) will launch the mission support campaign together for IKAROS and LightSail-1. LightSail-1 is an ultra-light spacecraft with a mass of less than 5 kilograms. With a sail area of approximately 32 square meters, its goal is to fly in Earth orbit to demonstrate control the attitude and orbit and increase the velocity under sunlight pressure. By holding the message campaign to collect words of encouragement from all over the world, we hope it can expand international communication and deepen people's understanding of solar sail research. * The IKAROS Message Campaign was completed. Thank you very much for your participation.